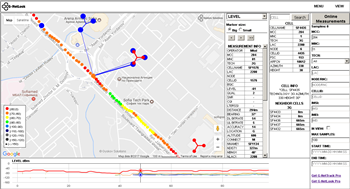 G-NetLook is a tool for visualization and analysis of mobile network. With it you can open and analyze G-NetTrack logfiles or online measurements data and visualize cells and neighbor relations. 1. Press MENU then select [Load Cellfile] and select your cellfile. The cell information will be loaded and cells will be displayed on the map. If you have too many cells in cellfile you can limit the number of cells on the map by checking [Cells in view]. Then only cells that are inside the current map view will be loaded. 2. Press MENU then select [Load Neifile] and select your neighbor cells file. The neighbor cells info is loadded. Clicking on a cell will display cell information in cell table and draw lines for neighbor relation. Click again on the same cell to hide neighbor cells lines. 1. Press MENU then select [Load Logfile] and select your logfile. The measurements information will be loaded and measurement point will be dispalyed on the map. 1. Select operator MCC, MNC for which you want to load data. Select also other options. You can limit measurement only in view zone. 2. Press the button [Online Measurements] and wait till data is loaded. The measurements information will be loaded and measurement point will be dispalyed on the map. Clicking on measurement points will display serving and neighbor lines and you can see the measurement info in measurement point table. You can change also thematic maps via drop down menu.